A nice looking and well-kept garage increases the selling value of a house especially for potential buyers who have an interest in cars. This means that a potential car-loving buyer is immediately turned off by an ugly garage floor and you already know why. Having an obvious oil stain, some cracks across the floor of the garage and a hole which is caused by the falling of a heavy object can make your floor look really ugly. Someone with a high preference for classic cars does not like to have a garage that looks like this and it also does not offer a convenient working environment. The great news it can be easy and inexpensive to treat an ugly floor and make it look as nice as the other parts of your home. 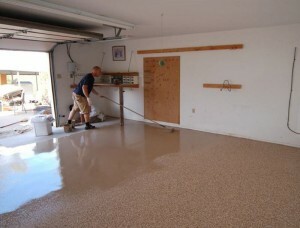 If you want a garage floor coating for your floor, it is best to use a high quality epoxy coat. The epoxy can protect the floor from future abuses and it can also fill in the minor abnormalities found on your floor. After the epoxy coat is applied and cured, it is almost indestructible. The application of epoxy is very easy and you can apply it over a weekend. The first step is to remove all the dirt, dust and loose chips by using soap and water and then any oil spots by using a good degreaser. After this, use a weak muriatic acid solution in order to etch the floor’s surface for better adhesion. Next, mix the resin and hardener and roll out the solution on the floor just like as if you were painting. If you also want, you can add a color to the epoxy or you have the option to sprinkle paint chips on the floor’s surface while the epoxy has not yet cured. You must also add non-slip compounds while the floor is still wet from the coating since epoxy can be very slippery, especially when wet if there is no “grit” present. Sea sand can do the job but it is not recommended because of the salt content of the sand. If you want to increase the saleability of your home, you can have this as one of your weekend projects. Check for more information and available options about epoxy coating by visiting our Garage Floor Coating Tips blog.